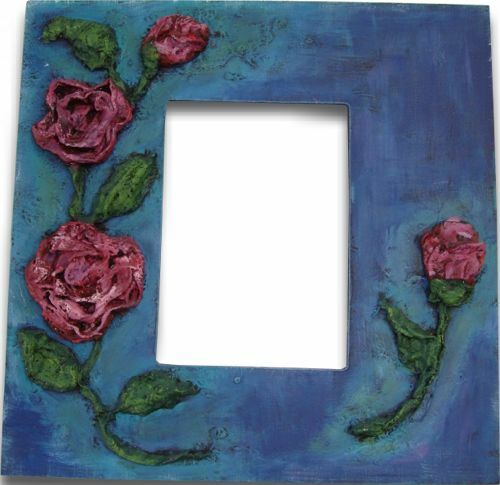 Plaster wrap creates lovely three-dimensional roses popping off the painted wood art frame. This pretty frame, designed by Heidi Borchers for Inspired at Home, would make a wonderful Mother's Day gift. Find this project and more in our pretty collection of 35 Homemade Mother's Day Flowers. Place the wax paper onto your protected workspace. Cut the Rigid Wrap gauze with scissors. You will need 2 pieces - 8” long for the large flowers, 2 pieces - 6” long for the buds, 5 pieces - 4” long for the leaves and 3 pieces 5 - 6” long for the stems. Follow the instructions on the package for dipping the Rigid Wrap into water. You will dip one piece at a time and place onto the canvas following the next step. Shape flowers and buds first. Push with fingers to help shape. For the stems twist the wet fabric to make it thin and narrow. Place onto frame at bottom edge of each flower. Tuck any excess under roses. For the leaves, fold the wet fabric in half, then pinch one end as you place onto the background to create the leaf shape. Make any adjustments before the gauze dries. Let dry completely. Paint the entire frame, the flowers, leaves and stems with black paint. Paint the background of the frame with several shades of blue. (I used navy, medium blue, teal blue) Paint the flowers with two or three shades of paint. (I used red, pink and white). For the leaves and the stems, use a dark green then brush a lighter green over the top. Heidi’s Designer Tip: Don’t worry about wiping excess plaster off frame as that lends to the background texture.